It's the second week of the new year and our second meal plan of our Whole 30 for the month of January. This week, I wanted to provide you some tips on freezing food to save you time and money. 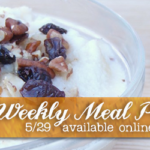 If you are using these meal plans, you can freeze leftovers to eat later or even double recipes and give yourself two weeks of frozen meals ready to go. For me, 2015 is about stepping outside of my comfort zone and trying new things. Of course, food is the easiest way for me to step outside of my comfort zone. In fact, my first recipe for 2015 was an Easy Shrimp Recipe, which was far outside of my comfort zone. Anyone who knows me realizes that I do not like to prepare fish and shellfish. However, I took a giant leap out of my comfort zone and have a wildly popular new recipe as a result. On this meal plan, I included a few recipes unlike any some of you might have ever tried before. Maybe you have never eaten oxtail or cooked with turmeric before? Maybe making your own almond milk intimidates you? Whatever it is, just take a deep breath and go for it. Try something new! Maybe even try freezing food that you have leftover from these new recipes!! However, stepping outside of your comfort zone does not need to be just about trying new food. This year, do the thing (or things) that you always wanted to do or said you would do someday. Take the college course, sign up for yoga or crossfit, go on that vacation (and vacationing alone is perfectly acceptable), write that book, go after the dream job. Whatever it is that is calling you, do it. Right now, leave a comment with that thing you have always wanted to do and the course of action you need to take to achieve it. Today is the first day to start turning your dream into a reality!! One of the most important tips to freezing food is investing in freezer-safe plastic bags, aluminum foil, plastic wrap and freezer-safe leak-proof containers. Vacuum sealers are also great for freezing food whether uncooked or leftover. Use freezer-safe labels to write on the outside of the package/container what is frozen, when it was frozen and reheating instructions. Keep a list on your refrigerator of the foods you have frozen and check off each one as you use it. It is safe to freeze meat and poultry in its original supermarket packaging. However, if the packaging is not air-tight, you should place the packages in freezer-safe plastic bags or double wrap them with aluminum foil or plastic wrap. Never refreeze raw meat. Once it is thawed, meat should be cooked as soon as possible. However, It is okay to thaw meat, cook it and then refreeze it. Never thaw raw meat or leftovers at room temperature. Instead, thaw them in the refrigerator or in cold water. Leftovers need to cool to room temperature and then placed in the freezer immediately. Leftovers that have been left out at room temperature for two or more hours cannot be frozen. It will need to be thrown away instead. When freezing food leftovers, do so in single portions. This will allow the food to freeze and thaw faster. Foods that do not freeze well are dairy (except butter), fruits and vegetables with high water content (lettuce, cucumbers, etc. ), raw eggs (with the shell) and mayonnaise. With all the information on freezing food, another week of meal plans and a new found motivation after commenting with your dream, here is this week's Whole 30 meal plan. Creamy Shaved Brussels Sprouts and Apple Salad from Do You Even Paleo?